The festival of “Dhanteras” as the name suggests is the festival to pray and plead the goddess of wealth and prosperity Lakshmi and Lord Kuber. As per the Hindu mythological stories Goddess Lakshmi appeared from the depth of the ocean with a pot full of gold, silver, jewels and other valuables after the churning of the ocean by devils and gods on this day. Thousands of years later also it has a significance of the Goddess appearing with all the valuables for us on the same day, i.e. the 13th lunar day of Krishna Paksh of the Hindu calendar month of Kartik. Dhanteras is celebrated on this day of the year. It is believed that on the festival of Dhanteras who so ever prays to the Goddess Lakshmi, is bestowed upon the showers of wealth, money and prosperity. As per tradition, the homes and offices or business centers after a thorough cleaning are decorated with flowers, lights / lamps and rangolis. On this day, the religious practices are held after the sunset for approximately two and a half hours. During this span of time one of the most significant ritual associated with this festival is that the ladies of the house make thirteen diyas (handmade lamps) from the wheat kneaded dough and light them with oil at the main gate or entrance of the house. This is a ritual to please Goddess Lakshmi and remind her that with these lighting diyas she is awaited by the devotee for her generous blessings. 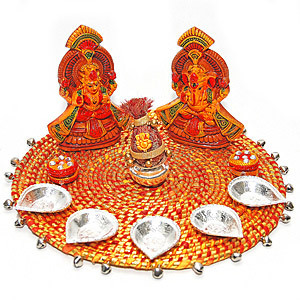 The lightening of diyas is followed by the prayers of health, wealth and prosperity. This is also a considerable day for shopping, especially that of metal. People shop for jewelry, gold, silver wares, silver coins, electronics and other necessities on this day. In some parts of India, it is also believed that lives of those who buy kitchenware on this day, is filled with prosperity and happiness. In 2017, Dhanteras falls on Tuesday, 17th October. It is an auspicious day, and as per the religious gurus and astrologer the whole day is equally significant for shopping and buying the desired items. Ensure that your houses are neat, tidy and decorated well, as it is believed that the Goddess Lakshmi bestows her blessings only to those who are neat and fresh. It is suggested that one does the religious rituals during the “Vrishabha Lagan” which is believed to be a fixed time when Goddess Lakshmi is believed to be inside our house. In 2017, the best time to hold the Dhanteras poojan is between 7:19 pm to 8:17 pm for approximately 58 minutes. Some people also find red as a significant color for Dhanteras and practice wearing bright and attractive festive colors. On the 14th day of the Kartik month of Hindu calendar falls the festival of Roop Chaudas, popularly known as “Choti Diwali”. In the five day celebration of festival of lights this is the second day of celebration. Though this festival is associated with the practices of pampering and grooming the beauty of women, as per the mythological stories the demon Narkasur was killed by Goddess Kali along with Lord Krishna. There are various stories linked with various rituals performed on this day. In the wide stretched country like India people narrate and practice different types of prayers and rituals on this day. In some parts of the country, this festival is associated with harvest and people cook delicious food items from the freshly harvested crop. In the old days when bathing was a luxury and was not practiced so frequently by the common man, it was said that those who take a holy dip on this day would certainly find heaven. On this day religious followers light fourteen diyas as a significance of the 14th day of the Kartik month. In the regions of Bengal this day is held for the special prayers of Goddess Kali. Since this day is also called “Roop Chaturdas” which means the 14th day dedicated to roop or beauty, it is common for the women to perform rituals to enhance their beauty. Taking a head wash and applying kajal are few of the widely practiced custom. This year the best time to perform poojan of the festival is from 4:47 am to 6:27 am. 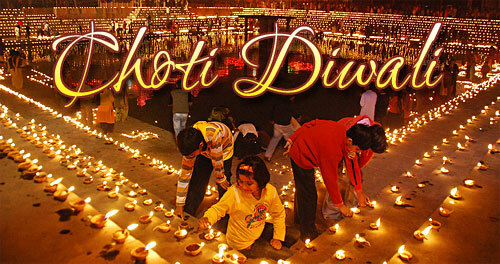 Diwali is one of the most auspicious and popular festival of Hindus in India and across the globe. In fact, in the past few years it has become a global festival. As per the Indian mythology when Lord Rama returned to Ayodhya along with his wife Sita and brother Laxman after completing their exile of 14 long years and killing Ravan, the residents of Ayodhya celebrated their return by lighting ghee diyas. Ever since then till date this festival is associated with lighting of lamps and hence popularly known as the festival of lights. The significance of lighting diyas was the occurrence of amavasya when Lord Rama returned from exile. Since there were limited source of lights at that time, in order to remove darkness and create bright environment, people took the support of diyas. Now with change in time, artificial and decorative lights have also been added for brightness. On this day people decorate their houses with beautiful rangolis, flowers, diyas and many attractive objects to attract Goddess Lakshmi. In the evening, special prayers are held to please Goddess Lakshmi along with Lord Ganesha. The reason behind worshiping Lord Ganesha and Godess Lakshmi is based on the story of Kartika – Mahatmya, according to which, one Brahmin who was poor was asked by a priest to worship Goddess Lakshmi. The Goddess showers her blessings for wealth, money and prosperity to all its devotees. Further, as per Hindu traditions / mythology, Lord Ganesha is always worshipped before praying to any other deity. Accordingly, we worship them together. Goddess Lakshmi is prayed with lots of sweets, fruits, and fresh harvest of the season. As per a common ritual two diyas one filled with oil and other filled with ghee are lit and kept in the pooja all night long in order to attract the blessings of the Goddess. People wear new clothes, fire crackers, exchange gifts and sweets with their loved ones. The charm of the city and homes is on its full swing during this time. In 2017, the poojan mahurat of Diwali is 7:09 pm to 8:17 pm and the suggested chanting mantra is “Kshirodarnavasambhute Surasuranamaskrite, Sarvadevamaye Matargrihanarghyam Namo Namah”. The fourth day of celebration of the festival of lights is known as Ankut / Annakut or popularly as Goverdhan pooja. According to the mythological story, on this day Lord Krishna lifted the mighty Goverdhan mountain on his little finger in order to save his devotees from torrential rain. In order to express gratitude for this kindness, the devotees offered a huge pile of variety of food to their Protector. In many parts of India prayers and prasad (a devotional offering made to a god, typically consisting of food that is later shared among devotees) are organized on this day and the followers offer great variety of food to their beloved Lord Krishna. This day is also the onset of the new year of the Hindu calendar. Out of the different practices held across India, the most popular is that on this day a special curry is cooked at home and a great variety of numerous vegetables and food items are cooked together. It signifies the traditional value of togetherness in the family and society. In the morning, ladies perform special prayer with the setup of cow dung cakes praying for the well being of their family members. This year the Goverdhan poojan mahurat is twice a day i.e in the morning from 6:32 am to 8:46 am for about two hours thirteen minutes and in the evening again from 3:28 pm to 5:42 pm for about 3 hours plus. 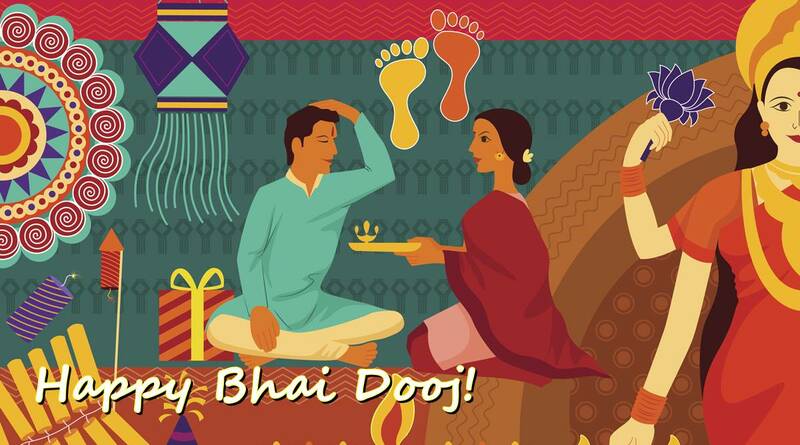 This festival is celebrated to cherish the love and mesmerizing bond of brother and sister. Just like Raksha Bandhan on this day also sisters perform religious pooja and rituals and pray for the well being of their brother(s). This festival is also known as Bhai tika or Bhai Beej in different parts of the country. On this day, sisters request their brothers to visit their place and cook their favorite food and sweet dishes. After feeding the brother(s) they put a tilak on their forehead, do pooja and other religious rituals, and pray for the good health, wealth and prosperity of their brother. This is the last day of celebration of the five day festival of Diwali, and observed on the second lunar day of Shukla Paksh of Hindu calender’s month of Kartik. It is believed that on this day the God of Death Yam visited his sister Yami. He was so pleased with his sisters’ love that he declared that all the brothers who are with their sisters on this day need not worry of death. This festival tightens the bond of love and care of a brother and sister. In 2017, the ideal time to perform the tilak ritual is between 1:12 pm to 3:27 pm.